In the early 17th century, this engraving was printed as the title page to the book, General History of the Deeds of the Castilians… (in Spanish, Historia general de los hechos de los castellanos en las isles y tierra firme del mar oceano), by Antonio de Herrera. 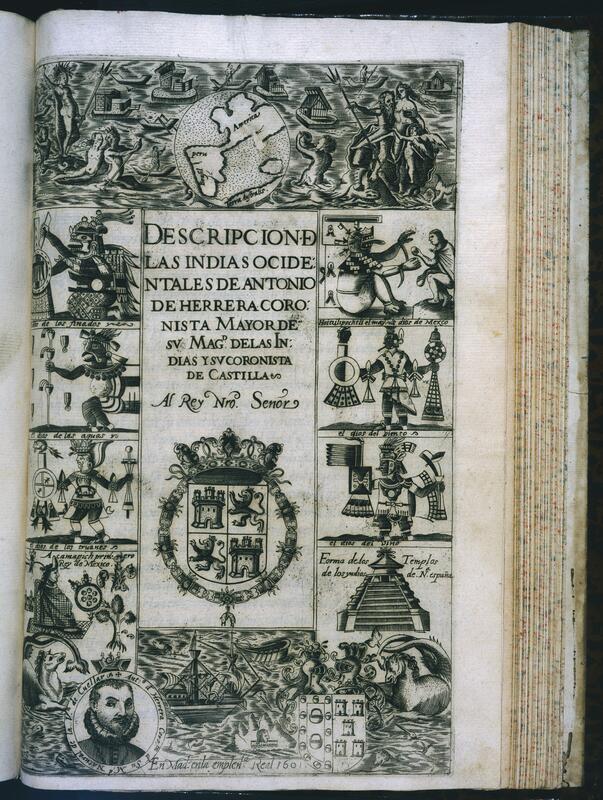 Above and below the title to this section, the Descripción de las Indias Ocidentales, are images of exploration familiar from European maps—ships, sea monsters and a map of the Americas. Eight rectangles run along the sides of the page, each displaying an image of a pre-Hispanic Aztec deity, ruler, or temple. These images were derived from those in colonial-era indigenous manuscripts painted in central Mexico. This title page, like the text it heads, reworks and represents a diverse range of sources on the Americas and the pre-Hispanic past. Arranged on the title page are scenes of Aztec deities. In the upper right is Huitzilopochtli. A god of war and empire, he was a primary god of the Aztec state worshipped at the Templo Mayor, the great temple in the sacred precinct at Tenochtitlan. Second from the top at left is Tlaloc, who was also worshipped at the Templo Mayor. Often represented in manuscripts with goggled-eyes, he was associated with rain and agriculture, and in this image, falling from the sky are two Aztec symbols for raindrops. At bottom left is Acamapichtli, a pre-Hispanic Aztec king. He appears in profile, wearing a turquoise diadem, a sign of his royalty, seated upon a woven mat. Surrounding him are Aztec-style place signs for towns he conquered while king. Below him is a portrait of the author, Antonio de Herrera, royal chronicler to the King of Spain. The building at lower right represents a generic “native temple” once found in the Americas. The stepped, pyramidal base topped by a conically-roofed building seems to be a composite of pre-Hispanic building types. For instance, the Aztec Templo Mayor (main temple) had two stairways climbing to the shrines at its summit, while other Aztec structures dedicated to the deity Quetzalcoatl are known to have circular elements. The Council of the Indies, the government body that oversaw Spain’s colonies, continually sought ways to know the far-flung empire. Historians, like Antonio de Herrera, were appointed to the Council to research and write chronicles like this one. Herrera also would have provided the source images and supervised the engravings for the frontispiece, which were carried out by Juan Peyrou. 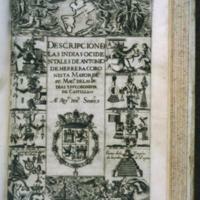 Antonio de Herrera held the post of royal chronicler of the Indies, working for the Spanish crown, when he produced this history of the conquest of the Indies. In this position, he had access to government papers and court collections—both written and pictorial. His working method and sources can be surmised from the imagery on this title page. Along the right and left edges of the page, pre-Hispanic deities, temples and rulers appear. The model for these were the indigenous manuscripts sent from the Americas to Madrid (where Antonio de Herrera did his research and writing). These manuscripts are now lost, but many scholars link at least one of them with the Codex Magliabechiano, now in Florence. In contrast, the coats of arms, mermaids and sea monsters have a long history on European maps. Antonio de Herrera’s book, General History of the Deeds of the Castilians, was one of the first works written in Europe that provides a comprehensive survey of the foundation of Spain’s empire in the Americas. The book opens with the “discovery” and concludes in 1554 which, for Herrera, marked the end of the conquest era. The title page images, although made explicitly for this work, later were reused in other volumes on the Americas, including some by the Protestant publisher, Theodor de Bry. Perhaps the most striking aspect of this title page is its appropriation of images from indigenous sources. At the time Antonio de Herrera was working, hundreds of indigenous objects, including histories and maps painted in the colonial period had been sent from the Americas to Europe. As official chronicler, Herrera had unique access to objects, books, and manuscripts in the royal collections. The indigenous images here signal the wide range of sources of Herrera’s knowledge about the Americas; they also introduce the foreign world readers will encounter within. Perhaps more importantly, the book subsumes indigenous memories of the pre-Hispanic past. Herrera’s title page drew upon indigenous manuscripts, yet those documents were painted after the conquest and had, already, re-cast pre-Hispanic memories to meet colonial needs. His book thus contributes to a new lineage of pre-Hispanic ideas and pictorial images that began taking form in the first century after the Aztec and Inka empires fell. Boone, Elizabeth Hill. 1983. The Codex Magliabechiano and the Lost Prototype of the Magliabechiano Group. Berkeley and Los Angeles: University of California Press. Cummins, Tom. 1994. “De Bry and Herrera: ‘Aguas Negras’ or the Hundred Years War Over an Image of America.” In Arte, Historia e Identidad en América: Visiones Comparativas. G. Curiel, R. González Mello, J. Gutiérrez Haces, eds. Pp. 17-31. Mexico City: Universidad Nacional Autonóma de México.